When will the aliens learn? It doesn’t matter how much more advanced their technology is than ours, or whether they attack us from the stars or from deep under the surface of our own planet. They can never hope to defeat us, because we have one weapon whose sheer might they can never overcome: the indomitable human spirit. As it turns out, though, all those assault rifles, rocket launchers, and other weapons we have lying around come in pretty handy, too. 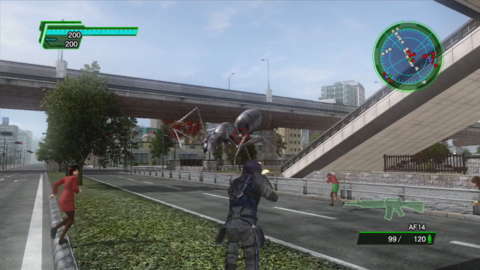 Like its predecessors, Earth Defense Force 2025 is a gleefully destructive romp in which you use powerful weaponry to kill aliens and to lay waste to city blocks, all in the name of saving humanity. Those city blocks don’t look the way we expect environments in games to look in this era of sophistication and refinement; like the laughable special effects in many of the alien invasion movies that clearly served as EDF’s inspiration, everything seems cheap. Appendages of giant insects poke through level geometry, and trees, once knocked over, blink out of existence. But then, there’s absolutely nothing sophisticated or refined about Earth Defense Force 2025. You can’t say that its chintzy graphics are an asset, but they’re not quite the detriment that they’d be in many games, because every aspect of EDF 2025 wholeheartedly embraces the series’ B-movie inspirations. The giant insects and massive enemy spacecraft recall the low-budget monster movies and sci-fi flicks of the 1950s, so when you hear the voice actors hamming it up with every cheesy line, their goofy delivery works to support everything else about the game. No matter which class you choose, your goal is the same: slaughtering slews of giant insects or destroying the spaceships and robots of the alien invaders’ armada. As a solo player, it’s fun to mindlessly mow down tons of huge, skittering ants, and even though the graphics are rudimentary, the sheer scale of some of the larger enemy ships means that it’s still impressive to see them come crashing earthward and then explode in a tremendous ball of flame after you’ve fired that last rocket into their glowing core. Even though none of your opponents require much strategy to deal with, the variety of your attackers helps stave off a sense of repetition, and as you progress, you keep acquiring new, more effective weapons to take with you into battle. However, the simplicity of the game’s silly, large-scale combat–initially an asset–becomes a detriment as the game drags on across 80-plus missions, and you’ll have had your fill of defending Earth long before Earth has been successfully defended. Oh, the carnage! Oh, the humanity! Oh, the graphics! The appeal of EDF is increased significantly when you play with others, both because most classes function best in a supporting role and because there’s so much more opportunity for unpredictable comedic mayhem when there are four of you than when there’s just one. You might be minding your own business and gunning down some giant spiders when one of your comrades “accidentally” drives a tank right into a building and brings it crashing to the ground. Or you can work together, combining your destructive might to turn that row of buildings into rubble. After all, who’s going to complain about a little collateral damage once you’ve saved humanity from extinction? The fact that you can revive your teammates when they go down in multiplayer also makes it preferable to playing solo. It’s frustrating in single-player to be several minutes into a mission only to be crushed under the leg of a gigantic walking fortress and have to start the battle all over again. EDF 2025 gives you a number of ways to play multiplayer, letting you do local split-screen co-op with one other player, or hop online by yourself or with a friend playing on the same console. There’s also a two-player versus mode, but it’s hardly worth your time; the entire appeal of EDF is in slaughtering aliens and destroying cities. The simple mechanics don’t lend themselves to the long-haul, 80-mission-plus campaign. This is the video game equivalent of a mindless and enjoyable popcorn flick, not a captivating epic. Even if the shallow action can’t sustain the game for its entire length, EDF 2025 is committed enough to its vision of cheesy, B-movie-flavored destruction to be fun for a while, particularly with a few friends in tow.